› Author AffiliationsFinancial support of this work comes from the Youth 1000 Talent Plan Program, the National Natural Science Foundation of China (Nos. 21602145, 81573290, U1603123), and West China Hospital, SCU (start-up funding). 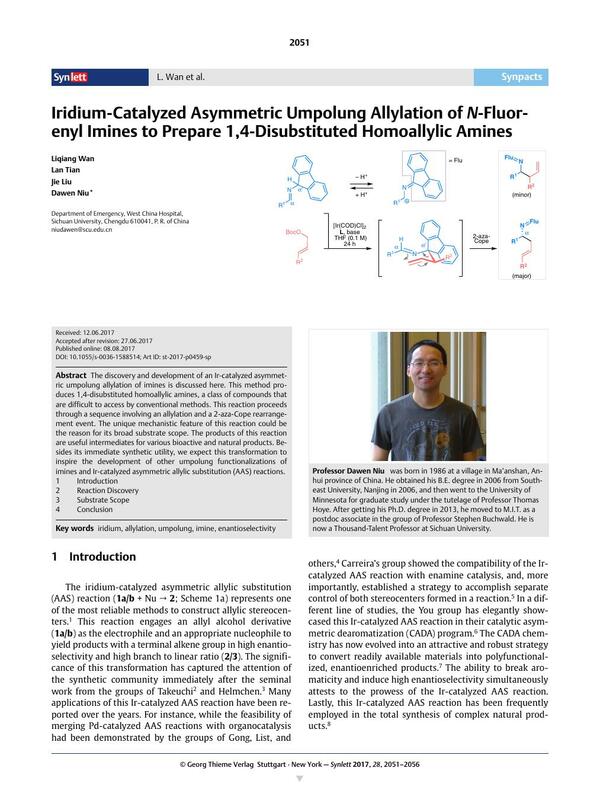 The discovery and development of an Ir-catalyzed asymmetric umpolung allylation of imines is discussed here. This method produces 1,4-disubstituted homoallylic amines, a class of compounds that are difficult to access by conventional methods. This reaction proceeds through a sequence involving an allylation and a 2-aza-Cope rearrangement event. The unique mechanistic feature of this reaction could be the reason for its broad substrate scope. The products of this reaction are useful intermediates for various bioactive and natural products. Besides its immediate synthetic utility, we expect this transformation to inspire the development of other umpolung functionalizations of imines and Ir-catalyzed asymmetric allylic substitution (AAS) reactions.